Philip Ogola at the scene of the 14 Riverside Drive terror attack. On the fateful day of the 14 Riverside Drive attack, I was on my laptop when reports reached me at about 3:50pm. My diary on January 15, 2018 included many things but creating a WhatsApp group for victims trapped in a building was not one of them. I had a meeting at 5:30pm on Ngong Road, so I was packing up to make my way there. Like everyone else, I began following the unfolding story on live TV while calling my family and friends to ascertain their whereabouts. "I have friends trapped in Amadiva Saloon, can you please find a way to help them?" she frantically enquired. At the time, social media was awash with all kinds of forwards and no one knew what was real or what was fake. I reached out to Philip Ogola, a well known digital humanitarian, who I had interviewed a while back. He assured me he would get the information to the right people and so I left it at that and carried on with my day. However, calls kept coming in from hysterical family and friends who all claimed that kin were trapped inside buildings around Dusit complex. I kept forwarding the same to Philip who assured me that action was going to be taken. "Initially, I was not planning to go to ground zero, but your texts began streaming in so I had to take action," Philip later told me. 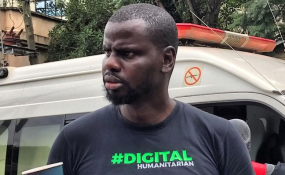 "I made my way to Kenya Red Cross and volunteered my services as a digital strategist, to collect and verify information coming in and relay safety messaging to the public," he said. As the rescue operations went on, distress texts turned into messages of relief as more and more people reached safe ground. However, by about 8:00pm no good news was coming from the Grosvenor building situated within the 14 Riverside Drive which also houses the Dusit D2 Hotel. At that point, I made the deciosn to create a WhatsApp group added all the numbers that I had received from family and friends of the victims. After adding Philip, he went on to add members of the rescue team to the group. "There are people who were almost shot by snipers as they scaled the walls to escape. During an active shooter event its best to keep your head down, and find a safe place to hide, until rescue team gets to you," Philip said. "Communication is very important, both for the rescue team and the people who need help. Through the WhatsApp group we were also able to give First Aid tips so members could assist their injured colleagues." The all clear signal finally came at 3:30am in the morning of January 16. Although most people in the group were rescued and safely evacuated, a few unfortunately lost their lives in the tragic events. "Thank you Boniface Nyaga and Philip Ogola for organizing this. You kept our hopes high and here we are safe. Home safe, may God grant us an uneventful day today," one of the survivors posted in the group after the ordeal.